EUROPEAN COMPACT SYSTEM ZOOM LENS 2015-2016 - Fujifilm Fujinon XF 16-55mm F2.8 R LM WR from EISA on Vimeo. 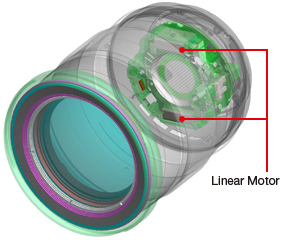 By reducing the weight of the focus lens and mounting the Twin Linear Motor, high-speed, quiet AF is possible. The fastest AF speed of 0.06 seconds brings comfort to your photo-shoot when by combining this lens with an X Series camera body* offering Phase Detection AF. Combined with the near-silent shutter sound, photos can be taken unnoticed in quiet locations.